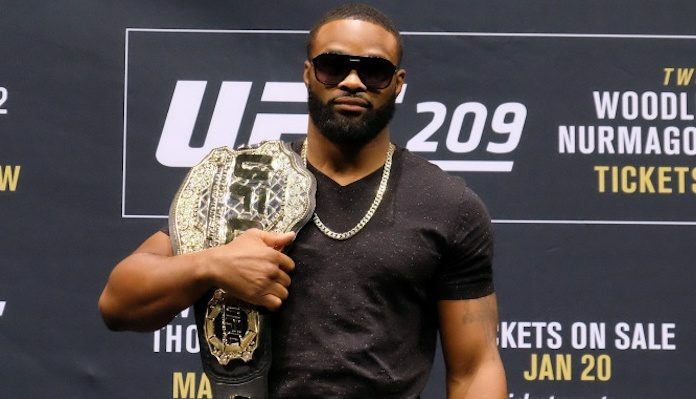 At UFC 235 in March, Tyron Woodley will look to successfully add another welterweight title defense to his list of accomplishments by taking out the red-hot Kamaru Usman. As the 170-pound king since July 2016, Woodley’s time in the division may be coming to an end by the time that 2020 rolls around. In the Summer of 2018, Tyron Woodley shared his idea for how he wants to end his career which is as the middleweight champion. But when exactly would his attempt to make that a reality start? Today the champ said that it could very well be this year. “I’m not about to BS this year,” Woodley said on Ariel Helwani’s MMA Show. “I’m about my business, and people at middleweight, you need to watch out too. I might slide on up by the end of the year. At UFC 234 next month, the middleweight title will be on the line as the champion Robert Whittaker looks to defend his turf against Kelvin Gastelum. Both have indeed fought at welterweight before in their respective careers. For Whittaker, he made the move up to 185-pounds in June 2014 after a loss to Stephen Thompson. Since then, the Aussie has rattled off an ultra-impressive nine-fight winning streak. Gastelum, on the other hand, began his career as a middleweight before dropping to 170-pounds following his winning of season 17 of The Ultimate Fighter. He would fight at welterweight six times on and off with two weight misses before heading back up. Before Woodley can make this dream a reality, he obviously has to get through Usman at UFC 235 as well as, presumably, Colby Covington.